The Field Warehouse was thus a summative statement of the possibilities and limits of fenestrated bearing masonry, and this was its primary legacy. “Simplicity,” wrote Montgomery Schuyler of its elevations, “could scarcely go further,” and this willingness to let planning and construction speak—refined, to be sure, by Richardson—influenced major Chicago projects in its wake. [i] James F. O’Gorman, “The Marshall Field Wholesale Store: Materials Toward a Monograph.” The Journal of the Society of Architectural Historians. VOl. 37, no. 3. Oct., 1978. 175-194. [ii] “Real Estate.” Chicago. Oct. 25, 1885. 28. [iii] James F. O’Gorman, “The Marshall Field Wholesale Store: Materials Toward a Monograph.” The Journal of the Society of Architectural Historians. VOl. 37, no. 3. Oct., 1978., 188. Harriett Monroe recalled Richardson visiting John Wellborn Root and inquiring about local techniques for building on Chicago’s soil. Harriett Monroe, John Wellborn Root: A Study of His Life and Work. (Cambridge: Riverside Press, 1896). 119-120. [iv] James F. O’Gorman, Three American Architects. (Chicago: University of Chicago Press, 1991). 49-50. [v] Industrial Chicago. op. cit. 186. [vi] James F. O’Gorman, “The Marshall Field Wholesale Store: Materials Toward a Monograph.” The Journal of the Society of Architectural Historians. VOl. 37, no. 3. Oct., 1978. 188. Over the winter I had one of those phone calls that every academic dreams about. A genuine Hollywood producer had some questions, and I was one of the few people in the world who could answer them. Did I have a few minutes? I’d sort of hoped they’d fly me out for a consult, but we managed to get through his questions over the phone pretty easily. He was working on the new TV series Pan Am, and was looking for information on the terminal at JFK airport. That building played a central role in my Master’s thesis, on international airport design, and I excavated some of that research for a paper that appeared in Design Issues in early 2005. That paper focused on the role the building played in the aesthetics of the jet age–vaporous, sublime interiors that went beyond mere function and provided something of an atmosphere for travelers in the early 1960s. The glass waiting area and the suspended concrete parasol of the original Pan Am terminal at Idlewild (later Kennedy) airport was maybe the clearest example of the clean lines and light construction that marked jet-age architecture. It went hand-in-hand with aircraft interiors and corporate branding programs that also emphasized cool style. Life magazine went so far as to stage a fashion shoot in and around the terminal in 1961. 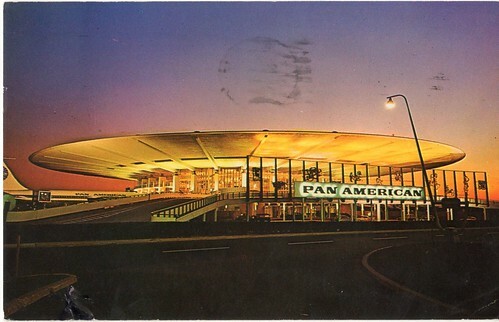 While the paper went on to show how much changed in five years–the terminal was converted into a far less atmospheric labyrinth of services and circulation for Pan Am’s new 747s in 1968–the show’s producers were interested in its early years, and rightly so. Pan Am premiered earlier tonight, and I have to say they got a lot of things right–the opening sequence in the terminal was an uncanny reconstruction using CGI of one of the early 1960s’ iconic spaces–one that’s still there but buried under a crust of later circulatory and security editions. A picky historian would have noted that there were also some things that weren’t quite accurate. The jet bridges, for instance, were designed like ship catwalks, and the show made them seem much more permanent. But they captured the jet age elan quite well, and I’d like to think that a relatively obscure paper and some off-the-cuff advice helped out a little bit. Now, if NBC wants to do a miniseries on Daniel Burnham’s office, I’m willing to consult, too. 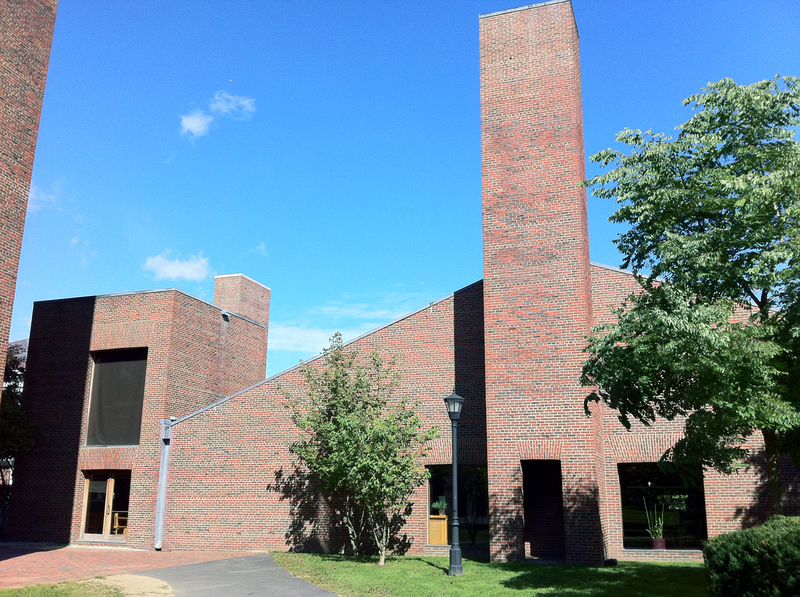 For a cut, or at least a trip to L.A.
For a few years now I’ve promised myself that I would take a day on the annual fifth year Boston field trip and go up to Exeter to see the Kahn library there. Last year a colleague took the train up while I was scrambling back to Iowa early and he let me know that it was an easy hour-long ride through some scenic mill towns and a similarly easy walk across the (small) town to Exeter Academy. Kahn was the first big research project I did when I moved to academia. After seven years of hearing his name at Foster’s I was curious to see whether you could make the argument that he was a proto-high-tech architect, in addition to his well-known reputation for poetic, spiritually resonant space. The link to me was irresistible, because if you could show that, you could then make the argument that a lot of high-tech is really more than the cold, mechanical imagery with which it’s been saddled. So I wrote a few essays on four Kahn buildings–the Yale Art Gallery, Richards Medical Labs, the Salk Institute, and the Kimbell Art Museum–and showed (I think) that part of their poetic appeal lay in a real technical fluency. That book, Louis I. Kahn: Building Art, Building Science, got some good reviews and won me a few ace lecture opportunities, but after five years of work I was ready to move along to Chicago. Still, knowing some things about Kahn made Exeter irresistible. I’d never been, and with a willing student and colleague, plus an alum who’s a good friend, we made the trek up Sunday. I have to say, it’s one of those rare buildings–like Kimbell–where you know the layout and section and all the tricks cold but can’t believe how amazing it all is when it’s put together. The interior space is so finely proportioned–and yet so impressive structurally–that it literally stopped us in our tracks. We did what every architect does, which is to walk up the curved staircase to the main floor and quietly roll our heads back, looking up at the skylight with our mouths open like turkeys in the rain. Exeter has a very generous visitor policy–if you sign the guest book, you get basically free reign–so we wandered for a couple of hours. (And, by the way, the guest book alone is worth browsing). 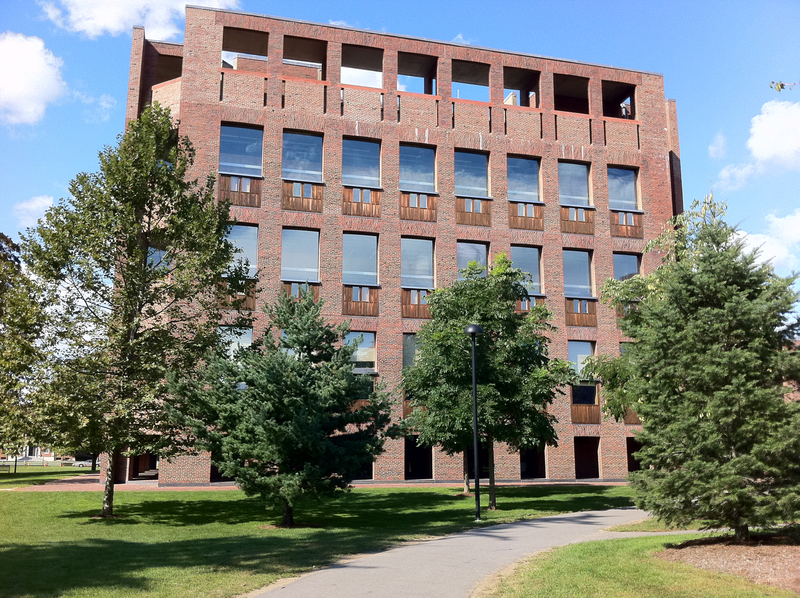 Much of the building’s rhetoric is about layering–there’s the central concrete core with the big circular concrete cutouts, the square donut of stacks, the tables and carrels at the windows, and the brick exterior. But within these are gaps that are occupied by services, clearly defined interfaces between materials, and circulation paths that brush the edges of sectional spaces brilliantly. I admit that I had always slightly dismissed Exeter (and Rochester, and Ahmedabad) as the most backwards of Kahn’s buildings since they rely so heavily on brick instead of concrete–I left these out of the book entirely, in fact. But now I’m not so sure. There’s a decidedly archaic feel to the Library, especially in the exterior arcades. But there’s also stainless steel ductwork that’s as expressive of the mechanical strategy as anything at Richards, and the concrete is as superbly executed as the Kimbell’s. I left thinking that I’d seriously underestimated this strain of Kahn’s work–and maybe it needs someone to go back and show how it, too, took function and construction as the basis of its expression, too. I was curious about the dining hall, which sits next to (actually almost on top of) the Library. It was part of the same commission, yet it hardly shows up in any of the critical studies of Kahn’s work. It was a pleasant surprise–a well executed but spatially less intricate mix of precast, in situ, and brick. We puzzled for a while about its layout–it sits about 5° off of the Library’s axis–and finally realized that the chimney terminates one of the Academy’s long axes. The slanted face looks west, and it catches the sunlight as you’re looking south in a way that punctuates that path really well. I have no idea whether that was Kahn’s generating idea or not, but it’s a nice touch. One that could use some further research..
You are currently viewing the archives for September, 2011 at architecturefarm.